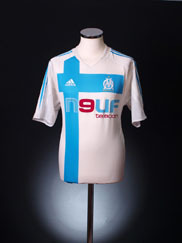 The Olympique Marseille shirt sponsor from 2004 to 2005 was n9uf Telecom. Olympique Marseille's 05/06 home shirt by Adidas with the traditional blue cross prominently featured on the chest, very nicely done and quite an eyecatcher. 2007-08 Olympique Marseille Player Issue Home Shirt Adidas Original Vintage shirt from Classic Football Shirts Ltd.